Fear of pain. Death. Loneliness. Missing out. Rejection. Failure. Being disappointed. Being a disappointment. Those words sucker punched me in the gut because my greatest fear is not belonging, being cast aside or overlooked. You know what that tells me? I put way too much stock in myself. Makes sense, doesn’t it? So when a situation arises that makes me feel like I could lose something dear to me, I do one of two things: latch on or let go. I either hold too tightly or just go ahead a push away so I don’t have to experience the pain that loss brings. It’s probably because I believed the lie that relationships can make me happy. Not so. Sure, they can bring happiness, but only the Lord can bring my happy. Fear rises up in the lies the enemy hurls at us. And I’ll tell you, he’s pretty good at it. I mean, he’s been doing this since the beginning of time. Guess that’s why he’s called the father of lies. But can I let you in on a little secret? He has a strategy. And if we can get a hold of his battle plan, we shut down his mission. Ummm David, dude, you already killed him. Why do you need to be so dramatic with the whole cutting off the head thing? Well, this is an interesting study and although we don’t have time to break it all down, I can tell you that some commentaries state that David did this just in case there was any life left in him. Others note how it was a cultural practice at that time and was proof of death. Either way, there’s a lot we can learn here. 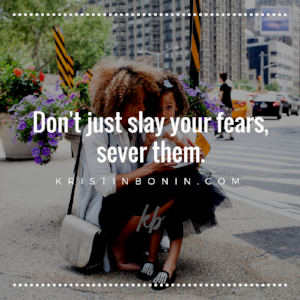 It’s one thing to slay your fears. It’s another to sever them. I’m a visual learner, so let’s envision. Say I have a fear of failure and am terrified to step out of my comfort zone and into what God is asking me to do. I can face a fear of failure and boldly do what God is asking of me anyways. Ok, Lord. I’m gonna do it afraid. And I do. Baam! Fear slaying! We generally stop there, right? Slingshot. Fallen Giant. Stick a fork in me, I won. I’m done. Not so fast. What if I ran up to the lie that was birthed in that fear and sever it with the truth? I need to ask the Lord: Why am I afraid to fail? What if the thing I see as a failure isn’t a failure at all? What if I trust God enough to know that if He asks me to do it, there is a purpose, regardless if it turns out the way I think it should. What if I slay the fear and sever the lies that it brought into my life? Just in case there is any life left. We have an enemy and his strategy is to lie. After that, he really doesn’t have many tricks in his hat. If you struggle with the lies he throws at you, I get you. I’ve been there…like an hour ago. Seriously. I wrote a devotional to help us Jesus girls sever these lies, forever. I’d love for you to join me in this battle of slay and sever. I know you have it in you. You are a warrior. Bare Naked Truths: Stripping Away The Lies That Derail Your Destiny, coming November 2nd. And I can’t wait!